The boyfriend's favorite sandwich is a Philly Cheese Steak. I've been thinking about how I would make a version for him at home, one that doesn't have peppers as he is not a fan. I finally got around to it and while I will definitely be making a second version soon with slight improvements, he seemed pretty happy with this one. The recipe makes enough for three sandwiches, but it only served two as he went back for a second helping. Heat a small pan over medium heat and add vegetable oil. Slice onions and add to the pan. Saute over medium heat and when the onions begin to get translucent (after about 10 minutes) add the mushrooms and continue to saute until onions turn brown. While the onions and mushrooms are sauteing, slice the beef into 1 inch wide strips and sprinkle with salt and pepper. Heat a large pan over high heat and melt butter in pan. Add beef strips to pan and brown on both sides. Toast rolls and add desired amount of ketchup and/or mayonnaise (I don't use ketchup, but the boyfriend slathers it on). 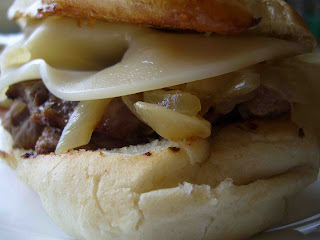 Layer 1/3 of the beef on each roll, followed by 1/3 of the onion mixture and two slices of provolone. Allow the cheese to melt slightly before serving. Enjoy! Welcome to Foodie! This Philly looks delicious! Ooh, Philly Cheese Steak! Looks great!